Capable of powering all of High Charity while not at full generating capacity for over 3,000 years. "I've remotely destroyed our Keyships. A security measure. Without them I cannot reach the Ark. But neither then can the thing." — The Librarian to the Didact. Keyship is a classification of superluminal Forerunner vessel in use at the time of the Forerunner-Flood war. Keyships were capable of activating slipspace portals leading to the Ark. Though many more once existed, the majority were destroyed by the Librarian to prevent the Flood from reaching the Ark. The Forerunner Dreadnought, as it was known by the Covenant, was a Keyship, although it is not to be confused with the Forerunners' dreadnought warship class. Keyships are geometric and angular, sharing many aesthetic features with other Forerunner constructs. Generally, they have a tetrahedral shape, with a forward triangular prow, and attached to it at equidistant points are three similarly shaped struts, to help ground the ship. Visually, their hulls are gray or silver in color. Keyships are estimated to be about 14 kilometers (8.699 miles) tall and is far heavier than leisure craft, but outweighed by a variety of transport and military vessels. 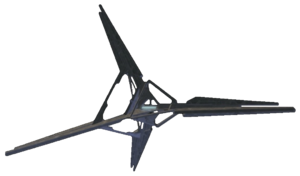 Although their weapons systems are unknown, one Keyship was found and used by the San'Shyuum during the San'Shyuum-Sangheili War, and was far superior to Sangheili vessels of the time. At the time of the Human-Covenant War, the same Keyship's shielding was completely impervious to even the heaviest of UNSC shipborne armaments, specifically the Magnetic Accelerator Cannon systems. A Keyship has been known to carry over 1,000 beings, which is believed to be only a fraction of its full carrying capacity. They were capable of remote detonation to prevent their usage by the Flood. A Keyship consists of numerous rooms, many of which are docking bays and control rooms, including a command chamber which was many stories high. During the Forerunner-Flood war,the Forerunners extensively used a fleet of Keyships. A number of Keyships were given to the Librarian, and combined with her ability to build slipspace portals to the Ark, the Librarian was able to transport herself back to the Ark with her Keyships if the situation required. The Librarian, however, destroyed her Keyships to prevent them from falling into the hands of the Flood, who with them, would be able to instantaneously travel to the Ark, rendering the Halo Array useless. Near the end of the war, the Keyships were part of an unknown strategy to hold off the Flood for nearly 79 years, although this advantage would be foiled by the massive computing power of the Flood. A group of Keyships on their way to reseed life in the galaxy. Keyships were also an integral part of the Forerunners' Library Project to preserve sentient life. Before the firing of the Array, the Forerunners gathered DNA and living specimens of the notable sentient species located throughout the galaxy and protected them from the devastation of the Flood and all other life via Halo by transporting them to the Ark. After the seven ringworlds fired out their pulses, several Keyships, containing preserved specimens of each species, were sent to the planets from which the sentient species originated, and released a population of the species on their planet of origin. These ships therefore were not only a vessel of war, but also designed to reinstate life on the planets devastated by Halo. Mendicant Bias would find his way onboard a Keyship to the San'Shyuum homeworld. No Keyships were to be left on indexed worlds according to the Forerunners' plan, leaving this particular instance a curious anomaly. By 2552, that particular vessel, referred to by the Covenant as the Forerunner Dreadnought, was most probably one of, if not the last surviving Forerunner Keyship in existence, used by the Covenant as an unusual source of power for their holy city, High Charity. At the end of the Ninth Age of Reclamation, the Prophet of Truth appropriated the dreadnought to activate the Portal on Earth and travel to Installation 00. It was last known to have gone to ground on said Installation, and is believed to have been destroyed upon the premature activation of Installation 08. In July 2557, while on Triniel to get an upgrade seed for the Ace of Spades, the crew visited a Builder facility where Rion Forge was drawn to the design seed for a keyship in a seed-building lab. Rion, who had a deep appreciation for starships, found it extraordinary to witness the plans for a vessel from an ancient alien race. 343 Guilty Spark identified the design seed as belonging to a keyship for Rion before moving on to crafting the Ace of Spades upgrade seed using the lab's systems. After their arrival to Installation 00 on 2558, Colony, two Mgalekgolo bond brothers that serve in the Banished, began focusing much of their attention on the activities near the resting place of the keyships, without informing the other Banished leaders. The Forerunner Dreadnought resting in the center of High Charity. The Keyship in Halo 2 on its way to Earth. The Keyship in Halo 2: Anniversary. Cortana watching the Keyship depart High Charity. A Keyship on its docking pedestal. Keyships departing from the Ark to reseed life in the Galaxy. Environment concept art for Halo 4 depicting a Keyship. ↑ As clarified in Halo: Broken Circle, the weapons on the Forerunner Dreadnought were added by the San'Shyuum and the vessel's massive advantage over Sangheili was due to its vast capacity to power the weapons. During its decommissioning, the keyship is stated in Halo: Contact Harvest to have been stripped of all weapons the San'Shyuum knew it possessed; thus, even if the ship had original armament, the San'Shyuum do not appear to have been aware of them.